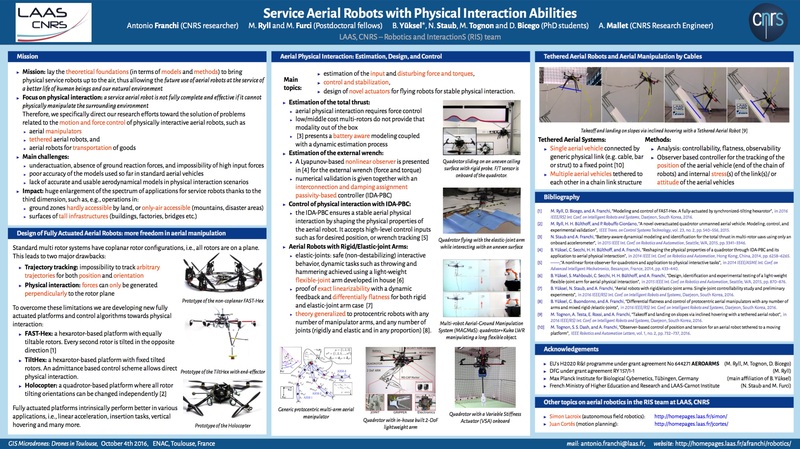 In this paper we design a nonlinear controller for aggressive maneuvering of a quadrotor. We take a maneuver regulation perspective. Differently from the classical trajectory tracking approach, maneuver regulation does not require following a timed reference state, but a geometric “path” with a velocity (and possibly orientation) profile assigned on it. The proposed controller re- lies on three main ideas. Given a desired maneuver, i.e., a set of state trajectories equivalent under time translations, the system dynamics is decomposed into dynamics longitudinal and transverse to the maneuver. A space-dependent version of the transverse dynamics is derived, by using the longitudinal state, i.e., the arc-length of the path, as an independent variable. Then the controller is obtained as a function of the arc-length consisting of two terms: a feedforward term, being the nominal input to apply when on the path at the current arc-length, and a feedback term exponentially stabilizing the state-dependent transverse dynamics. Numerical computations are presented to prove the effectiveness of the proposed strategy. The controller performances are tested in presence of uncertainty of the model parameters and input noise and saturations. The controller is also tested in a realistic simulation environment validated against an experimental test-bed.